Annandale SC hosted the first of the Scottish Travellers for the N12 class on 17 April. 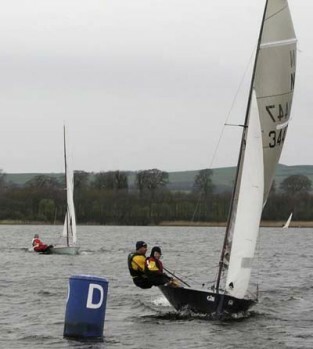 In the first race Mark and Emma Simpson developed a healthy lead, with Bernard Clark and Andrew Mitchell holding second place until a bad gybe gave them a dunking and, with another capsize later on, they eventually finished the race in seventh. Ian Simpson and Tressa King, who had been overhauled by Clark and Mitchell on a reach, must have had a wry smile as they sailed past, and held on to second place to the end of the race. Race 2, sailed on full stomachs after Annandale demonstrated their usual high level of hospitality, saw the Simpsons again out in front, but Clark and Mitchell managed to stay upright this time and claimed second, just ahead of Simpson and King. The whole fleet enjoyed some superb planing conditions, with the wind holding at Force 4. Race 3 saw the same finishing order, and with the wind speed increasing during the race the fleet were glad to get ashore and pack up, particularly given the onset of rain.